The Holyoke Winter Carnival’s mission is to create a week long, city-wide, series of winter themed art and entertainment events that enriches the cultural, economic, and social vitality of the City of Holyoke. Simultaneously, its goal is to strengthen community spirit, belonging, and connectedness to the natural setting of the Mount Tom Range. 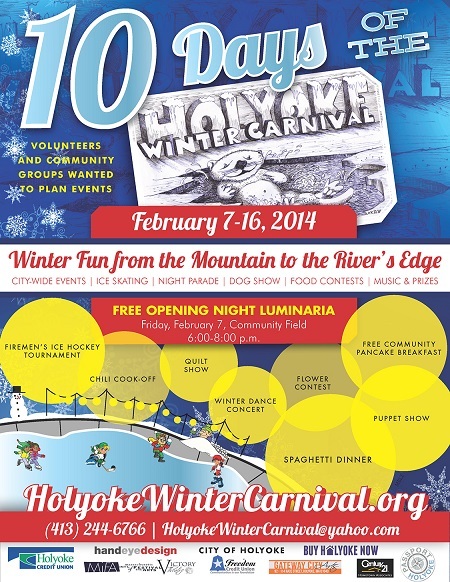 The winter carnival encourages community organizations, churches, schools, and businesses to sponsor unique, creative, and inviting winter theme events that celebrate Holyoke.